Domain name is the most important need of the business today.Always look for the domain name according to the name of your business. It is as important as choosing a name for a business, as it set for lifetime. When you are looking for a domain name you should follow few thumb rules. Now we have more choice in domain name with the origin of new domain extensions like .photo, .mob, .co, .guru and so on. You can choose those domain names according to your business. But first of all you need to decide the name of domain that you want to choose. Always keep focus on name of your business when you decide to buy a domain name. Always make your domain name as your business name smartly. If your company name is something like, Cobler Info Ltd, you can opt for Cobler.com or CoblerTech.com or Coblerinfo.com. Select at least 5 random keywords and 10 popular keywords. You can use bustaname service to find the domain name suggestions. if your are newbie then you may get confused about domain extensions. My recommendation is that first you try to get .com domain and if .com not available the you can go for other domain extension from .co, .guru, .photo and many more. You already know that the name not easy to remember can never called good domain name? For example: whoossaazt. Can you remember this name? Now look at this domain name: EASKME- E – ASK – ME. Now you know the difference? Now decide domain that is easy to remember. Make sure that you don`t violate copyright policies of any existing brand. For example WordPress Never allow you to use Wordpress in domain name. So you can use WP instead of WordPress. Never use domain name with hyphen. These days with changes in search engine algorithm it is not easy to rank domains that include hyphen. If you don`t find the domain name without hyphen then it`s better to choose alternate domain name. Do not go for such name that are already registered in multiple combinations. To make your Site name a Brand it must be unique. You can buy domain names from any of these domain registrar. 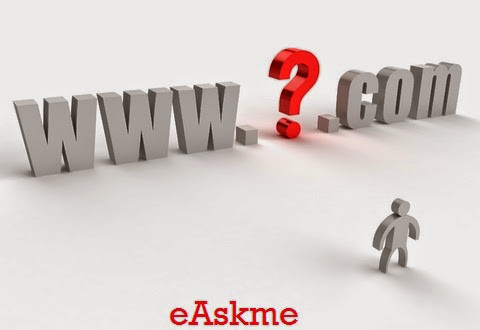 eAskme: $10 We personally provide domain help and registration service. So this is about how to select great domain name. if you have any question do ask in comments. Do share your own suggestions. If you like this article, don`t forget to share it on twitter and Google Plus.